This cozy pent house condo with private terrace is a perfect South Padre Island destination any time of year. This two, two baths vacation condo has an ocean view from living room and master bedroom and sleeps 6 guests. It is a perfect destination for a couples weekend or small family vacation. Saida condo offers the perfect balance of relaxing atmosphere and modern amenities. From this perfect location, you can walk to the beach or walk down the street for great shopping and delicious restaurants. The living room features new tile floors, beautiful tropical furniture that exudes casual elegances. 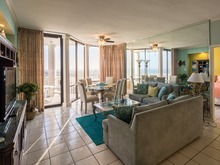 Look out the wall to wall expansive windows onto the Gulf or step onto the balcony of the pent house for a closer look of the beach and the waves. Living room features an LCD TV. The fully-equipped kitchen features granite counter top, brand new stainless steel appliances, a smooth top stove, full size refrigerator with ice maker, toaster oven, glass blender, coffee maker, electric can opener, electric mixer, and non-stick pots and pans. The kitchen is open to the living room. The dining room is just off the kitchen and features a great dining table with chairs for four. Second bedroom features two queen beds with plush mattresses, sleeps 4. This room features a large LED TV.